Tuition fees in Northern Ireland could stay the same for indigenous students, under a new scheme being examined by the Employment and Learning Minister. Danny Kennedy said the Welsh Assembly's decision not to increase fees for Welsh students wherever they study in the UK, may be considered in Northern Ireland. Mr Kennedy said he discussed details of the scheme with the Welsh Education Minister, Leighton Andrews. Their departments are now in "close contact", he added. The Welsh Assembly announced earlier this month that it would pay the difference between current fees and any increased fees of up to £9,000-a-year wherever Welsh students study in the UK. It means that Welsh students who go to university in 2012-13 will be paying the same £3,290 fee as current students. Mr Kennedy said: "The decision by the Welsh Assembly Government to invest very significant sums of public money in keeping fees at their present rates for Welsh students offers one possible way forward for Northern Ireland. "I have spoken to the Welsh Minister for Education, Leighton Andrews AM, and my officials are in close contact with their Welsh counterparts to explore the details of the scheme. "If appropriate, and if Northern Ireland's public finances allow it, I will recommend that the Executive and Assembly consider it alongside other models of university and student funding in the forthcoming public consultation." However, Mr Kennedy said the situation in Wales differs from Northern Ireland in the sense that it "imports" a lot of students, while Northern Ireland is an "exporter". 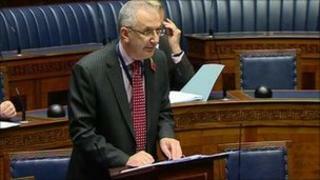 He added: "As I have said in the Assembly, I want a 'made in Northern Ireland' approach to student fees. What is done in London and Cardiff undoubtedly holds lessons for us, but the point of devolution is to devise local solutions."